Ah, the curious subject of food anomalies. People claim to see celebrities in their toast, animals in their crackers (pun intended), and UFO’s in their oatmeal. There’s even a Museum of Food Anomalies dedicated to this edible hoopla. Who knew?! To this day I still childishly identify cloud shapes and have been patiently awaiting my very own food miracle. Well folks, here it is. 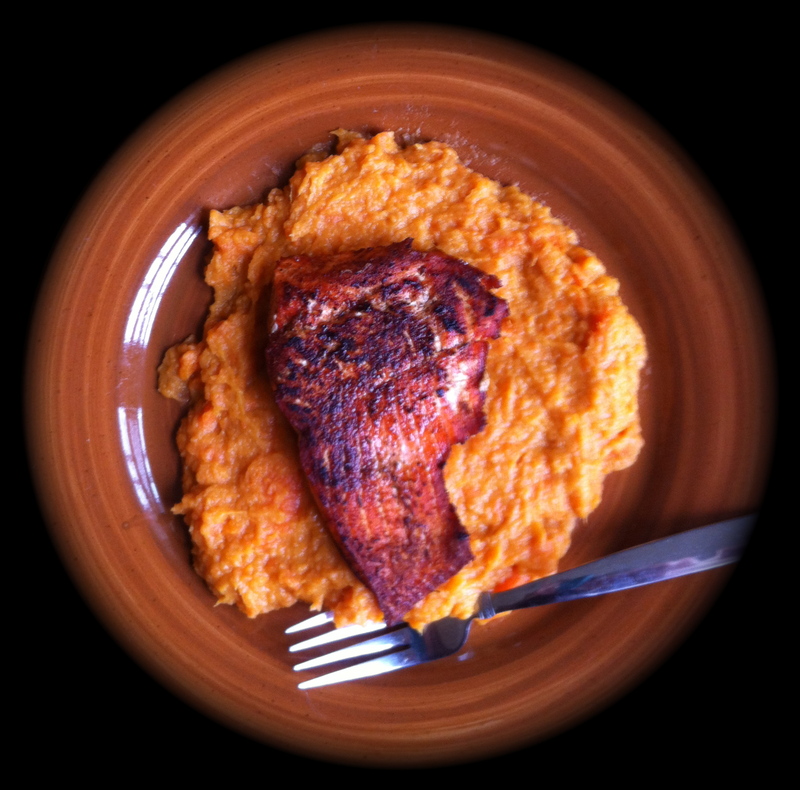 The hubby made salmon and sweet potato and carrot mash, one of my favorite meals. I was beside myself when I peered down at my plate. I took a picture, because who knows if something this monumental will every happen again. It had to be documented. Then, the nerdy geography enthusiast side of me struck up an internal debate over whether or not the salmon looked more like Africa or South America. After carefully comparing the image with my world map, I’m leaning towards South America. I think you guys should decide in this poll. And, please feel free to share any of your oddball food sightings in the comment section. You know it’s fun! lol I thought the same thing when I saw it!!! It is definitely South America! 🙂 I love the poll and how split everyone’s responses are so far… so funny! I followed your instructions and did my best to ignore my instinctual vision. My hubby saw the dino right away and pointed him out. Now, I’m with ya! No way! It’s just that I’m into dinosaurs a lot!! Playing with our food, are we? Funny.